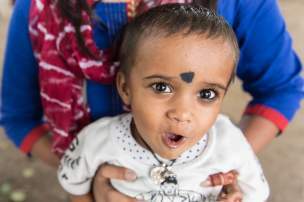 Learn about the energetic two-and-a-half-year-old named Biraj, and how his mother attributes Vitamin A to improving his health. Loud, squeaking sounds pierced the air and caught our attention at a vitamin distribution in Haldwani, India. The unexpected source? A pair of shoes, worn by a small boy who cheerfully wandered away from the crowd. His name, we later learned, is Biraj; the shoes, we found out, were intentionally loud. 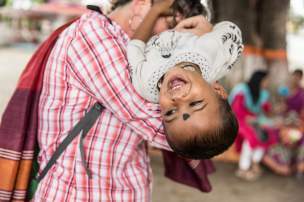 Since two-and-a-half-year-old Biraj is always eager to explore, his mother, Maryn, shod him with shoes that could easily alert her to his whereabouts. Despite his large sense of wonder, the curious toddler was notably small for his age—a probable consequence of lacking access to nutritious foods since he was a baby. Maryn shared that Biraj used to suffer from diarrhea regularly. But, she said that after receiving both vitamin A and a deworming tablet at the community’s previous distribution, his symptoms cleared up and now he has much more energy, which was abundantly clear! Biraj is forging the way—squeaky shoes and all—toward a healthier childhood.